Sundays — Sat evening: 5 p.m.; Sun: 8 a.m., 10:30 a.m., 6:03 p.m.
Holy Days — Holy Day: 8:30 a.m., 7 p.m.
Daily — Mon-Sat: 8:30 a.m.
After Archbishop John A. Floersh created St. Albert the Great Parish in 1959, the original 149 families attended Sunday Mass at Stivers (now Walden) School. Father Robert Willett was the first pastor. Groundbreaking for the church and school took place February 14, 1960. Staffed by the Dominican Sisters of Springfield, Kentucky, and lay teachers, the school opened in 1960 with 286 students. The first Mass in the new church was celebrated November 20, 1960. During the next ten years, the parish grew to 540 families. The school was expanded twice and eventually had three classes of every grade. A parish council was formed in 1971. Hendricks Hall, a multi-purpose center, was built in 1995. By this time, the school enrolled 553 students, and church membership was up to more than 1,400 families. On September 12, 1998, ground was broken for a new church building. 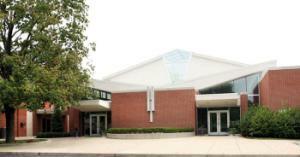 Archbishop Thomas C. Kelly, O.P., dedicated the new church, which seats 1,000, on October 22, 2000. The O’Bryan Center, the original worship space, now renovated into parish offices, also was dedicated that day. Meanwhile, the Kevin Caster Media Resource Center was dedicated on February 20, 2000. It contained media and computer centers, art, science, and music rooms, and two classrooms for all parish use. The renovation of the cafeteria into a multi-purpose facility (called Visitation Hall) was completed and dedicated in the fall of 2003. St. Albert is outstanding for its Blue Ribbon school, its active seniors group of 300, and its youth programs. Currently with 4,500 parishioners, St. Albert continues to enhance programs and ministries offered within the parish as well as to the community at large.